You’ve been asking. So here it is!!! 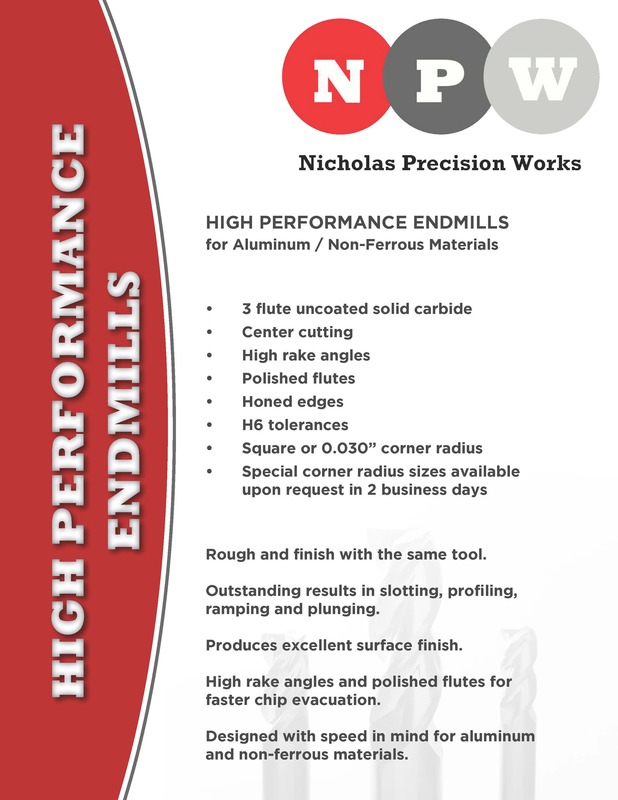 Nicholas Precision Works is proud to present HIGH PERFORMANCE ENDMILLS for Aluminum in stock and ready to ship. Check out the flyer below for available sizes. Contact us at sales@npwtools.com for pricing. We specialize in solid carbide tools to meet your exact needs and requirements. Nicholas Precision Works provides engineered specials, custom tool manufacturing, and precision regrinds. We are centrally located in North Manchester, IN and are ready and able to help. Give us a call, like us on Facebook, or join our email newsletter. This entry was posted in News and tagged carbide cutting tools, chamfer mills, corner rounding mill, counterbores, custom drills, custom endmills, custom tool manufacturing, drill bits, drills, endmill, engineered solution, engineered special, flat bottom drills, form tools, high performance endmill, high performance endmills for aluminum, high perfromance, keyseat cutter, Made in Indiana, Made in the USA, modified standards, Nicholas Precision Works, NPW, npw tools, NPWTools, reamers, rush delivery, step drills, step reamers, thread mills on May 16, 2018 by tony.nicholas100@gmail.com. Need a chamfer mill with a non standard angle? How about a chamfer mill with a odd cutting diameter or a chamfer mill with a reduced shank? No problem!!! Nicholas Precision Works can help. NPW offers chamfer mills with any angle from 1° to 89° and diameters from 1/8″ to 1-1/4″. We can even reduce the shanks to fit your machine. 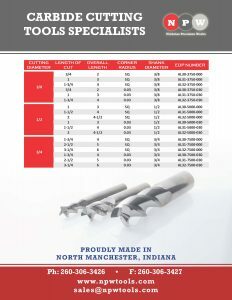 NPW’s tools are Proudly Made in Indiana. This entry was posted in News and tagged carbide cutting tools, chamfer mills, corner rounding mill, counterbores, custom drills, custom endmills, custom tool manufacturing, drill bits, drills, endmill, engineered solution, engineered special, flat bottom drills, form tools, keyseat cutter, Made in Indiana, modified standards, Nicholas Precision Works, NPW, npw tools, NPWTools, reamers, rush delivery, step drills, thread mills on October 23, 2017 by tony.nicholas100@gmail.com. Nicholas Precision Works grinds all our carbide cutting tools in North Manchester, Indiana. Supporting, promoting and growing companies that manufacture products in Indiana is vital to all Indiana residents. A strong local economy makes for a strong Indiana economy which makes for a strong American economy. A win-win for everyone. Nicholas Precision Works proudly supports the Purdue Manufacturing Extension Partnership’s “Made in Indiana” program. Check out their website below for Nicholas Precision Works and many other “Made in Indiana” companies. 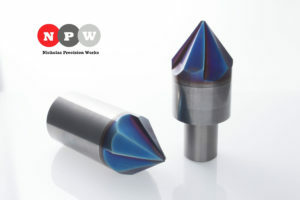 This entry was posted in News and tagged carbide cutting tools, corner rounding mill, counterbores, custom drills, custom endmills, custom tool manufacturing, drill bits, drills, endmill, engineered solution, engineered special, flat bottom drills, form tools, keyseat cutter, Made in Indiana, Nicholas Precision Works, npw tools, NPWTools, precision regrinds, reamers, rush delivery, step drills, step reamers, thread mills on June 21, 2017 by tony.nicholas100@gmail.com. Nicholas Precision Works offers drills for all your holemaking needs. Flat bottom, coolant thru, jobber, screw machine, step, and center drills just to name a few. We use tool geometry and coating selection to provide excellent tool life and performance. This entry was posted in News and tagged carbide cutting tools, corner rounding mill, counterbores, custom drills, custom endmills, custom tool manufacturing, drill bits, drills, endmill, engineered solution, engineered special, flat bottom drills, form tools, keyseat cutter, Nicholas Precision Works, NPW, npw tools, NPWTools, precision regrinds, reamers, rush delivery, step drills, step reamers, thread mills on June 15, 2017 by tony.nicholas100@gmail.com. Nicholas Precision Works produces thread mill cutters to meet any need. Single profile threads, multi profile threads, NPT, NPTF, helical flute, straight flute, and coolant thru can all be manufactured. We also modify the tools for special length threads, longer or short reach, modified neck diameter, or custom thread forms. This entry was posted in News and tagged carbide cutting tools, corner rounding mill, counterbores, custom drills, custom endmills, custom tool manufacturing, drill bits, endmill, engineered solution, engineered special, form tools, keyseat cutter, Nicholas Precision Works, NPW, npw tools, NPWTools, precision regrinds, reamers, rush delivery, step reamers, thread mills on May 31, 2017 by tony.nicholas100@gmail.com. Do you need a precision regrind? Nicholas Precision Works can take your worn tooling and perform a precision regrind to return the tool to like new, maybe even better. In today’s cost-conscious world, NPW can help you get the full use of your tooling investment! We offer several solutions from just end work to a complete regrind. Give us a call. We are here to help! 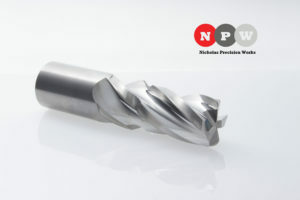 This entry was posted in News and tagged carbide cutting tools, corner rounding mill, counterbores, custom drills, custom endmills, drill bits, drills, endmill, engineered solution, engineered special, form tools, keyseat cutter, Nicholas Precision Works, NPW, npw tools, NPWTools, precision regrinds, reamers, rush delivery, step reamers, thread mills on May 16, 2017 by tony.nicholas100@gmail.com. Need a RUSH Delivery? Nicholas Precision Works can help!!! Got a machine down, need a tool fast, current supplier let you down, or all of the above? Nicholas Precision Works can help!!! Custom formed solid carbide 4 flute 0.694” diameter endmill with 0.098” corner radius and 1.5” flute length blended to a 0.039” R, to a 0.079” R, and to a 30° angle on a ¾” shank. Nicholas Precision Works was contacted by a local company in a panic looking for help. Their current supplier dropped the ball and could not deliver for 3 weeks. We visited the shop and took a look at the application and offered to help. We came back to our shop and designed, manufactured, and delivered a custom endmill in 7 WORKING HOURS!!! Our tool performed like a champ! It provided outstanding surface finish, nearly 3 times the feed rate, and was actually there when the customer needed it. 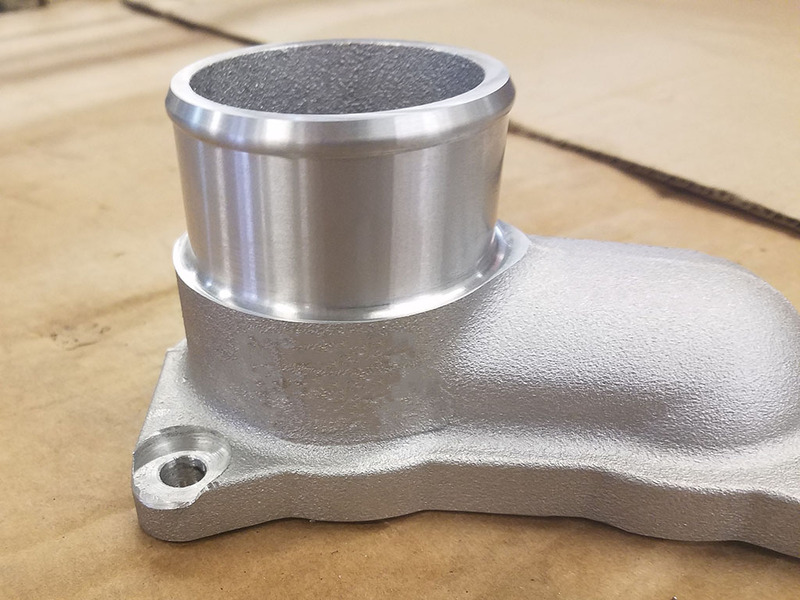 Nicholas Precision Works provides engineered specials, custom tool manufacturing, and precision regrinds to meet your exact needs and requirements. We are centrally located in North Manchester, IN and are ready and able to help. Give us a call, like us on Facebook, or join our email newsletter. This entry was posted in News and tagged carbide cutting tools, corner rounding mill, counterbores, custom drills, custom endmills, custom tool manufacturing, drill bits, drills, endmill, engineered solution, engineered special, form tools, keyseat cutter, Nicholas Precision Works, NPW, npw tools, NPWTools, precision regrinds, reamers, rush delivery, step reamers, thread mills on May 8, 2017 by tony.nicholas100@gmail.com. Got a tool that’s just not performing? Nicholas Precision Works can help!!! 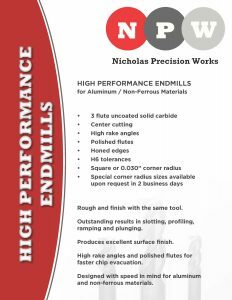 Nicholas Precision Works takes your problem tools then designs and develops a solid carbide engineered solution. We have simple solutions like different lengths, different corner radius, or different coatings. We also have more complex solutions like combining multiple tools into to one and done engineered solution. 3 flute engineered solution form tool!!! This entry was posted in News and tagged carbide cutting tools, corner rounding mill, counterbores, custom drills, custom endmills, custom tool manufacturing, drill bits, drills, endmill, engineered solution, engineered special, form tools, keyseat cutter, Nicholas Precision Works, NPW, npw tools, precision regrinds, reamers, step reamers, thread mills on May 1, 2017 by tony.nicholas100@gmail.com. Need a custom tool? Then check us out! Just a few of our latest carbide cutting tools and engineered solutions. They have been designed around your processes and your machines capabilities. Solid Carbide Custom Engineered Solutions! ANYTHING YOU CAN DREAM UP!!! Nicholas Precision Works can help! We specialize in solid carbide tools to meet your exact needs and requirements. 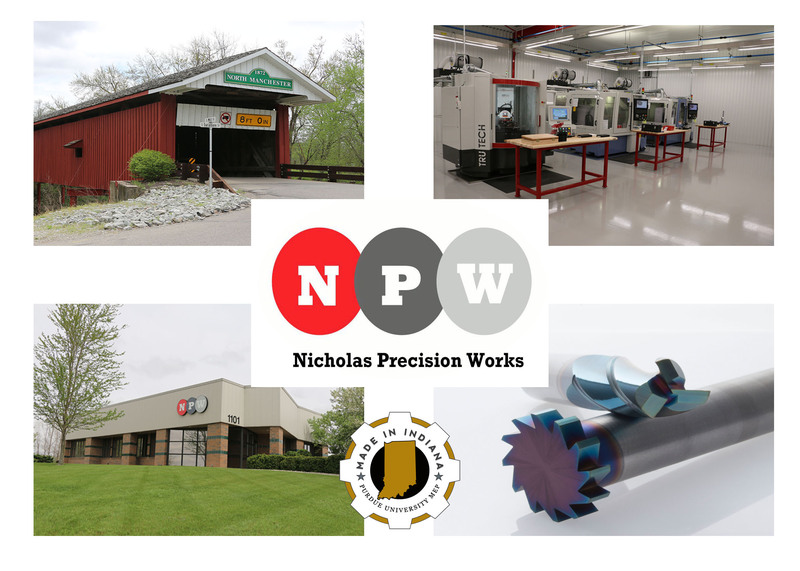 Nicholas Precision Works provides engineered specials, custom tool manufacturing, and precision regrinds. We are centrally located in North Manchester, IN and are ready and able to help. Give us a call, like us on Facebook, or join our email newsletter. This entry was posted in News and tagged carbide cutting tools, corner rounding mill, counterbores, custom drills, custom endmills, custom tool manufacturing, endmill, engineered solution, engineered special, form tools, keyseat cutter, Nicholas Precision Works, NPW, npw tools, precision regrinds, reamers, step reamers, thread mills on April 21, 2017 by tony.nicholas100@gmail.com. Check out some of our latest carbide cutting tools and engineered solutions. They have been designed around your process and your machines capabilities. Machine doesn’t have enough horsepower?? Don’t need a standard catalog length of cut?? Limited by shank size of the tool?? Have a great idea, but can’t find someone to built it?? Nicholas Precision Works can help! We specialize in carbide tools to meet your exact needs and requirements. Nicholas Precision Works provides engineered specials, custom tool manufacturing, and precision regrinds. We are centrally located in North Manchester, IN and are ready and able to help. Give us a call, like us on Facebook, or join our email newsletter. This entry was posted in News and tagged carbide cutting tools, corner rounding mill, counterbores, custom drills, custom endmills, custom tool manufacturing, endmill, engineered solution, engineered special, form tools, keyseat cutter, Nicholas Precision Works, NPW, npw tools, precision regrinds, reamers, step reamers, thread mills on April 17, 2017 by tony.nicholas100@gmail.com.